For many visitors to Ireland, Dublin is their first stop. And what a great introduction it is. The city has an irresistible atmosphere. It’s full of youthful energy – just sample some of the hip bars and restaurants to see what we mean – yet its rich history is apparent wherever you wander. An open top bus tour is a great way to get your bearings and the witty commentary will remind you how much the Irish love the spoken word. Once you leave the city limits, it’s the stunning coastline that really makes an impact – head as far north as Carlingford Lough in County Louth and south to Brittas Bay, County Wicklow. Along the way you’ll find breath-taking beaches framed by rolling sand dunes rushing down to the sparkling Irish Sea. Move inland to counties Cavan, Monaghan, Meath, Westmeath, Longford, Offaly and Laois and the contrast is spellbinding. 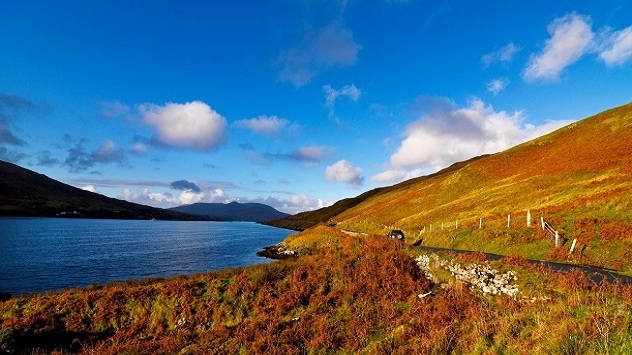 Carpeted in acres of pristine countryside, hills and mountains, lakes and rivers, this is rural Ireland at its very best, with charming towns and villages bustling with infectious energy. You’ll also stumble across a stunning selection of stately homes and gardens, plus intriguing ancient sites, such as Clonmacnoise, County Offaly and the fascinating megalithic passage tombs at Newgrange, Knowth and Dowth in County Meath. The East Coast also thoroughly enjoys its sports – from soccer, rugby and athletics to our home grown Gaelic games - football, hurling and camogie. Golf courses are also abundant around this region, and include challenging coastal links and idyllic tree-lined parkland courses, depending on your preference. County Kildare, meanwhile, is the home of Irish horse racing with the National Stud and various first-class racecourses placing their pedigree high on the international pedestal. If you fancy a flutter on the horses, Kildare is a centre of excellence for all things equine, and well worth a visit on your trip to the East Coast. Enjoy the sights and sounds of Dublin, a cosmopolitan city with a wonderful sense of tradition. Stroll around leafy squares of perfect Georgian houses and the cobble-stone courtyards of Trinity College, or take a trip to the Guinness Storehouse to see how Ireland's famous drink is produced. Hang out in snugs of atmospheric old pubs, or trendy bars and clubs with world class DJs. Shop in designer boutiques or grand old department stores like Brown Thomas and Arnotts. And you're never far from a fascinating gallery or museum, such as the Chester Beatty Museum or the Dublin Writers Museum. Overnight in any one of the plethora of hotels, guesthouses or B&B's around the capital city. It's south and out into the countryside on the R115, and very soon you're in the Wicklow Mountains, surrounded by hills and valleys, forest and woodland, where you can stop off to cycle, walk or ride a horse. Cross over the Sally Gap Mountain and pay attention to the spectacular views that envelop you - then take the R756 to Glendalough. This is a serene spot, with misty valleys and still, glassy lakes. It's also the site of an ancient monastery and St. Kevin's Church. Carry on through the National Park (N81, R411, R413, M7) to Kildare, where you can tour the Irish National Stud and adjoining Japanese Gardens and St. Fiachra's Gardens. 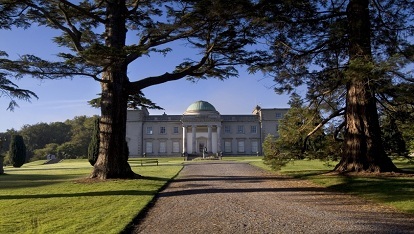 From Kildare it's a quick trip on the M7 to Portlaoise and the grand Emo Court House, County Laois - a neoclassical country villa with landscaped gardens and great vistas. Get back on to the N80, N52 and R394 north to visit yet another majestic pile - Tullynally Castle, just outside Castlepollard in County Westmeath. This is a real fairy-tale castle, with towers, turrets and enchanting gardens. Stop overnight in the midland's town of Mullingar. Head north towards Killykeen Forest Park, County Cavan with its lakes, islands and woodland. Woven around the rippling waters of Lough Oughter on the River Erne, there are marked trails leading you into the dark forests, where you can get close to the exquisite flora and fauna of the area. There are ample opportunities to walk, fish, or go pony trekking and if you want to enjoy more, stay overnight in onsite log cabins. 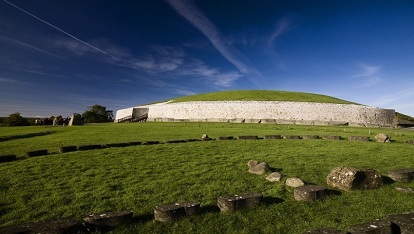 From Cavan town take the N3 towards the fascinating megalithic site of Newgrange, which has a roof that has stayed miraculously waterproof for over 5000 years. A UNESCO World Heritage Site, this ancient burial mound covers an area of over one acre and is surrounded by 97 kerbstones, which are elaborately decorated with megalithic artworks. From here its an easy trip down the M1 to Dublin ready for your ferry or plane journey home. - Walk the mountain trail in the Slieve Blooms, County Laois. - Be a dweller of the past at Causey Farm, Navan, County Meath, trying your hand at turf cutting bodhran (small Irish drum) classes, ceili dancing and more. - Explore the lovely coastal towns of Dun Laoghaire, Dalkey and Killiney in the Dublin suburbs. - Cast your eye over the beautiful designs at Cavan Crystal, and maybe choose some for friends and family back home. 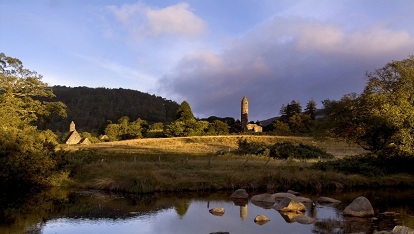 Glendalough: the monastic marvel at the centre of Ireland's Ancient East.